The John C. Freeman Weather Museum at the Weather Research Center in Houston, Texas, recently honored three weather heroes for outstanding service in 2010. The Weather Hero Award is given to individuals or groups who have demonstrated heroic qualities in science or math education, volunteer efforts in the meteorological community, or assistance to others during a weather crisis. 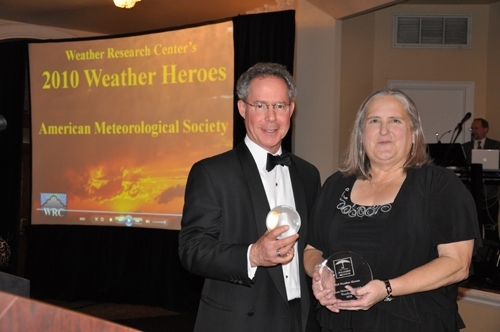 The 2010 Weather Heroes honored were the American Meteorological Society, KHOU-TV in Houston, and Kenneth Graham, meteorologist-in-charge of the NWS New Orleans/Baton Rouge office. Jill Hasling, president of The Weather Research Center and executive director of the John C. Freeman Weather Museum, presenting the Weather Hero Award to AMS, along with Robert Orkin, chairman of the board of The Weather Research Center. KHOU-TV was honored for hosting Weather Day at the Houston Astros baseball field in fall of 2010. Weather Day was a unique educational field trip and learning opportunity that featured an interactive program about severe weather specific to the region. Over the course of the day, participants learned about hurricanes, thunderstorms, flooding, and weather safety—highlighted by video, experiments, trivia, and more. Graham received the award for his support of the Deepwater Horizon Oil Spill cleanup. As meteorologist-in-charge of the New Orleans/Baton Rouge forecast office in Slidell, Louisiana, Graham started providing weather forecasts related to the disaster immediately following the nighttime explosion. NWS forecasters played a major role protecting the safety of everyone working to mitigate and clean up the oil spill in the Gulf of Mexico. The awards were presented at the center’s third Annual Groundhog Day Gala and its fifth annual Weather Hero Awards on 2 February 2011. The Weather Research Center opened The John C. Freeman Weather Museum in 2006. As well as housing nine permanent exhibits, the museum also offers many exciting programs including weather camps, boy/girl scout badge classes, teacher workshops, birthday parties and weather labs.